Escape to Winhall and have the getaway of a lifetime! This vacation rental home has 4 bedrooms, 3.5 bathrooms, and space to sleep 11 of your friends and family members. Cross-country ski and snowshoe trails score the 10-acre property which boasts a brook and marvelous views of Stratton Mountain. The cozy interior features delightful amenities like wood-burning fireplaces, 2 master suites, a state-of-the-art kitchen, and a luxurious bathroom! Everything about this space promises a memorable time! There's nothing not to love about this wonderful home! The spacious open living space features a wood-burning fireplace perfect for gathering around with your loved ones. While lounging on the leather sofas, watch a movie on the flat-screen TV with DirecTV and an Amazon FireStick. The fully equipped and state-of-the-art kitchen has everything you need to prepare meals for your family! Rendezvous at either of the dining tables to enjoy your feasts together. 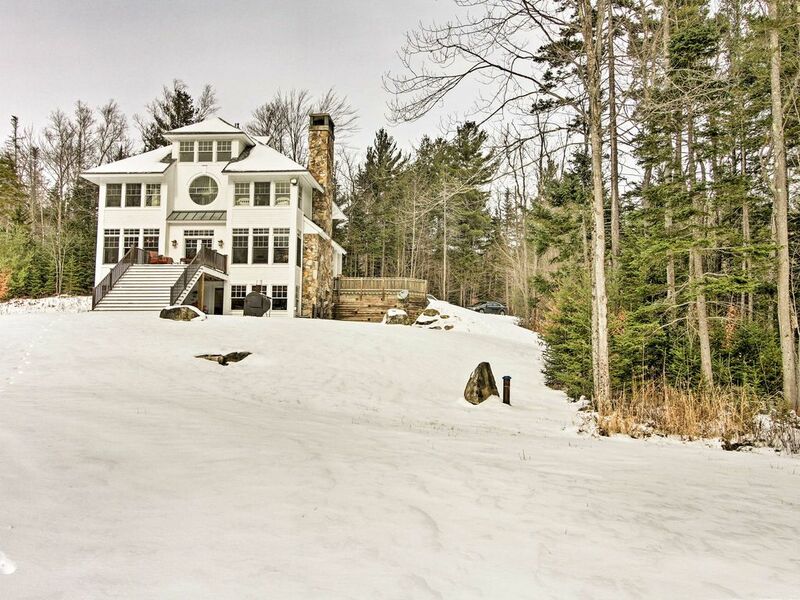 Outside you'll be treated to an expansive yard with a fire pit, meandering brook, 10 acres of walking paths great for cross-country skiing and snowshoeing, and stunning views of Stratton Mountain. Have a cookout with the gas grill or have a lobster boil with the propane burner and large pots and relax on the furnished patio as you watch the sunsets. Head out the garage-turned-game room where you can enjoy a foosball table and dart board. In the basement, you'll find a cozy living space with a fireplace, flat-screen TV and a private master suite with a king-sized bed and a private bathroom. The upstairs loft is a delightful kid's getaway complete with 2 twin beds and a plush sofa. The third-floor master suite with a king-sized bed and luxurious en-suite bathroom and the 'White Room' with 2 twin beds both boast breathtaking views of Stratton Mountian. 'Robin's Blue Room' features a queen-sized bed and completes the amazing sleeping arrangements! Additional sleeping is available in the master suite closet where a twin bed can be found. Bromley Mountain is less than 10 minutes away and Stratton Mountain is about 7 minutes from your front door! Stratton Mountain offers snowmobiling and tubing rentals, mountain bike tours, tons of kid-friendly events, along with cooking events and outdoor concerts during the summer months. Bromley Mountain features an amazing amusement park, ziplines, and downhill carting! Perfect your Crow Pose at the famous Wanderlust Yoga Festival held throughout Stratton Mountain. Frolic in the sun, breathe in clean air, enjoy unobstructed views of the stars, and experience a yoga retreat like never before! During warmer months, spend relaxing days at the Stratton Snowmaking Pond, not even 2 miles away. You'll discover calm waters perfect for wading, paddling, playing, and fishing. This hidden gem is family friendly and provides fun for everyone. Head to Manchester, 12 miles away, and never run out of things to do! Learn how to flyfish at Orvis before taking your new skills to the open water, indulge in a massage at the Equinox, peruse farmers markets and fairs, and visit Hildene-The Lincoln Family Home Estates. Our group of 2 families with young kids really enjoyed our stay at this fantastic ski house. Perfect layout and ideal location with easy access to Stratton, Bromley and Manchester plus a network of trails right out the back door. We hope to return next season! Absolutely stunning home! Amazing owners! Our family had an amazing weekend away at this beautiful home in Winhall. The home is truly beautiful in every way!! The owners couldn’t have been any nicer, they were completely accessible, responsive and went out of their way to help us with our questions. We would love to return to this beautiful home!!! We had an absolutely lovley time in your beautiful home. We were all very happy and comfortable for the 4 days of our stay. Your home is prestine and The Morning views are so very tranquil. We loved how accessible it was driving to both Stratton and Manchester- perfect for our stay. You were an amazing host, every detail providing the comforts of home was attended to....My girls especially loved the giant size Jenga!! Thank you for a great stay and we look forward to returning soon.. The property, the house, the location... you can’t beat it! This home has large windows that overlook a beautiful picturesque view. It’s clean, comfortable, and cozy with big couches and an awesome fireplace. Close to local mountains and shopping. I can’t say enough good things about our stay. We will definitely be back!! !